The Indian mobile manufacturer Zync has launched the new Zync Z5 phablet. pricesd below Rs. 10,000 this is one of the lowest proced phablet in the Indian market today. The tablet powered with a 1 Ghz processor boasts a grand 5 inch capacitative five point multi-touch display. It runs on the Android 4.0 Ice cream sandwich operating system and supports dual SIMs. The phone has a powerful 8 megapixel rear camera with flash and a front 0.3 megapixel camera. The phone has a internal memory of 4 GB and a RAM of 512 MB. The memory can be expanded to 8 GB with support of a microSD card. The phone comes with a host of pre-loaded apps and access to the Google Play store. The connectivity is supported by Bluetooth, Wi-Fi and 3G. It also has a proximity sensor. With the phablet you get a large 2500 mAH battery. 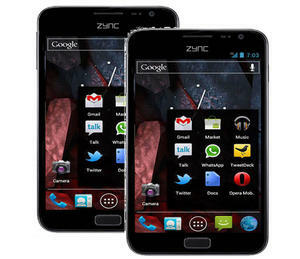 Do not go by the price posted o the Zync website, the price at which this phablet can be bought is Rs 9,490.